SYI is now booking mission experiences for summer 2019. Spots fill up fast, so be sure to reserve yours now! A unique mission experience for your youth group in Pittsburgh, Pa., at Pittsburgh Theological Seminary. Your group will be immersed in the neighborhoods of Garfield and East Liberty by serving alongside Garfield Farm and Open Hand Ministries. 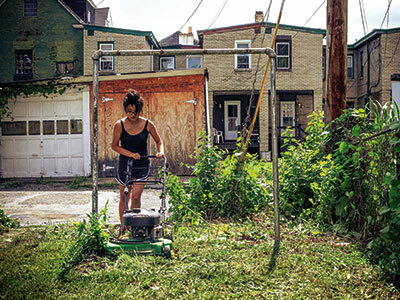 These two organizations work to transform abandoned land and homes into spaces that are a blessing to the community. Your experience will be theologically grounded in discussion and study of what it means to be a neighbor in conjunction with the faculty and staff of Pittsburgh Theological Seminary, Garfield Farm, Open Hand Ministries, and Fred Rogers Productions. Groups must have at least 10 people. The cost is $400 per person and includes: double occupancy rooms with private baths at Pittsburgh Theological Seminary in Calian Hall, breakfast Sunday-Friday and boxed lunches Monday-Friday, evening speakers, devotional materials for the group, and all programming fees. Dinners and weekend meals can be prepared in the full kitchen that is accessible in Calian Hall or ordered from a number of local restaurants. Contact us at syi@pts.edu or 412-924-1443 with questions or registration information.